In the recent years, Bollywood has kept keen eyes on expanding its audience. While working on this how could they ignore the China which is the most populous country in the world followed by India itself? Aamir Khan is a name very clearly known to Chinese. His movies release here and make the huge profits. Now, other actors from Bollywood are also looking up to the Chinese Market. Aksay Kumar is one of those. Akshay Kumar’s movie “Toilet: Ek Prem Katha” has been released in China today. The movie title has been changed to ‘Toilet Hero’ for the Chinese audience. ‘Toilet Hero’ is released in over 4,300 screens across China, which is 50 percent higher screen count compared to its original release in India. 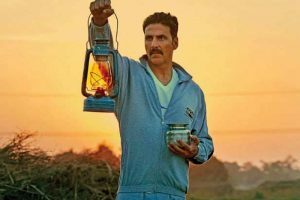 Toilet: Ek Prem Katha (Toilet: A Love Story) Directed by Shree Narayan Singh, is a Bollywood movie which focuses on the lack of toilets in rural India, which results in the practice of open defecation. Although, it has all the usual Hindi cinema tropes – song, dance, action, melodrama. It is admittedly a simplistic telling, but then, if the film is meant to spread awareness, such a guileless, and transparent narration is essential. Keshav (Akshay Kumar) is a middle age man living in Mandigaon, a small village in Uttar Pradesh. He is over-age for marriage now. 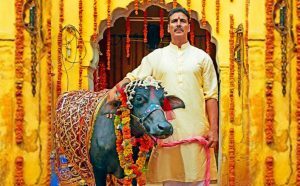 He couldn’t get married earlier due to his ultra-conservative superstitious father (Sudhir Pandey) who doesn’t allow his son to marry until bad omen in his kundli (Horoscope) has passed; film starts off with Akshay getting married to a cow, to ward off evil, which is hilarious. The actress Jaya has played a role of a well-educated girl whose path crosses with Akshay Kumar in a train and she falls in love at first sight. After a brief romance, they decide to get marry. When Akshay seeks approval from his father, he makes another superstitious claim that the girl who would get married to Akshay must have a deformed extra thumb. In order to win father’s approval, Akshay makes a prosthetic on Bhumi’s hand. The father agrees for the match and Akshay-Bhumi gets married. But the very next morning all hell breaks loose, when Jaya finds out that the house doesn’t have a toilet. Forced to wake up before dawn and march to a distant field under cover of the dark sky, huddling with other village women for safety, the outraged Jaya causes an unprecedented upheaval of the general order with her demand for a private toilet. It threatens her marriage, exposes outdated traditions, and puts pressure on the government to deliver on its promise of Swachh Bharat (Clean India), Prime Minister Narendra Modi’s top-billed social campaign. Jaya (Bhumi Pednekar) orthodox father-in-law expects servility and unquestioned obedience. She gets frustrated by his outright refusal to build a toilet, in keeping with ancient Hindu customs that require toilets to be as far away from the angan (courtyard) as possible. Jaya heads to her parents’ house, determined to return to her husband only after her demand is met. But when news of her mutiny goes national, she slowly comes to the realization that her quest cannot just be for her own betterment, but for thousands of girls and women all over India caught up in the same struggle. Akshay Kumar as Keshav, a man who supports his wife’s cause and, in doing so, unwittingly spearheads a revolution. He is an ordinary guy trapped between his domineering father, miserable partner and the hostility of an entire village. His only help is his brother, Naru (Divyendu Sharma). Keshav’s fight to construct a private toilet in his home, and a public one for Mandigaon, feels like a propaganda vehicle for Modi’s Swachh Bharat, but exposes the reality which in the rural Indian people face. Even In this 21th century, According to a study by the United Nations, one billion people worldwide practice open defecation out of those, 600 million is in India, which is more than half of the total. The second half of the movie is slow, less interesting and somewhat political. The movie transforms into Swacch Abhiyaan campaign preaching and the PM Modi gets a mention, too. There are several other mistakes too, such as Akshay’s village has internet, Wifi but no public toilets. At the end of the movie, women of the village revolt with ‘lotas’ (water pots for toilets) which is quite sudden and the last mark. The film is nearly three hours long. The plot winds its way to a rather predictable conclusion. The movie manages to accomplish what it sets out to do: a push for Modi’s vision of “Clean India”, and the welfare of women as well as awareness in the audience. In the whole movie Keshav’s persistence that the issue is not about toilet but thinking, needs to be applauded. The author is a master’s degree student at the Communication University of China, Beijing. Kyon India ke lia marae ja rahae ho ? Pakistan ki nationality choir aur India chlain jaoe .